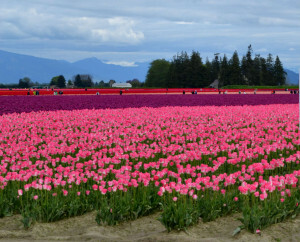 Sixty miles north from Seattle, Interstate 5 drops 300 feet to just above sea level to the idyllic Skagit valley floor encompassing almost 100,000 acres and stretching out to the distant Chuckanut Mountains about 25 miles away. The valley is bounded by the Salish Sea to the west, the Cascade foothills and the City of Mt. Vernon to the east, rolling hills to the south, and the steeper Chuckanut Mountains to the north. The Skagit River tumbles from the depths of the Cascade Range, trisects the valley after flowing by Mt. Vernon, before heading to the sea. Prior to the early settlers arriving, this same land was the Skagit River’s delta which teemed with life for salmon, shellfish, crustaceans and birds and an integral part of the culture for the Native Americans. Now conversely with protection by levees, dikes, and tide gates, this same ground ranks among the top 2% of the soils in the world to grow food, fiber, and flowers, predominately in land-based farming. Despite its pastoral appearance, as in any community, there continues to be pressure for change. A developer in 1989 proposed a 280 acres amusement park at a key highway intersection on prime farmland igniting the fight for the farm economy. Farm advocates organized, fundraised, and built electoral support to sustain the identity and purpose of this fertile farmland by creating a non-profit organization Skagitonians to Preserve Farmland, with its mission its title. Early on this required farm advocates sitting opposite developers, environmentalists, and government staff in hearings, courtrooms, and county offices advocating, cajoling, and fighting for the rights to farm and protect farmland. Skagitonian founders knew that for an agricultural economy to succeed, it takes a critical mass of farmland, irrigation water, labor, farm roads, machinery, equipment and fertilizer suppliers, large animal veterinarians, purchasers, and of course, a farmer. To thrive farming must be a robust, economic driver and sustained by the community. These bonds to farming now run deep not only in the agricultural community, but among all residents. 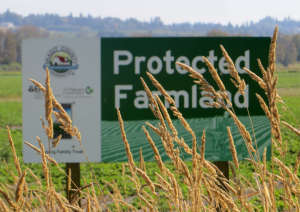 Twenty years ago the Skagit County Commissioners established the Farmland Legacy Program funded with a Conservation Futures (property) Tax to create a fund that could match state and federal grant monies to purchase development rights from threatened prime farmland. This program has protected more than 9,000 acres of prime farmland. Even with this buy in, now 25 years later since Skagitonians started, the conflicts are less forceful, but still intense and important. Now, agricultural, environmental, economic, not-for-profits, Port of Skagit, and government (city, County, State, schools, etc.) people meet, to discuss their differences and reach solutions while maintaining and nurturing the Skagit identity, which is a thriving economy balanced with the natural world. After 25 years, all sectors sit at the table to support a community that embraces farming as a way of life. Economic development is a buzzword across the United States and finding projects that create jobs, add wealth, and grow placemaking are sought by many communities. One Skagit agricultural product in its infancy is growing grains, specifically barley and wheat for artisanal products. The boutique booze boom is crafting multiple varieties of specialty whiskeys produced from grains grown in the agricultural rotation sequence necessary to maintain soil friability and health. Mainstream and boutique beer brewers across the United States use only about one dozen barleys with different malt processes to create a myriad of beers. 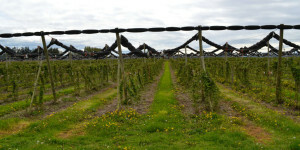 Skagit farmers are growing multiple test plots of some of the more than 20,000 different types of barleys to make craft brews. Skagit Valley Malting is partnering with beer brewers such as Pike Place Brewery to concoct new beer frontiers with the different barley samples. I sampled only four different barley kernels destined for Skagit Valley Malting’s production cycle and was astounded at the flavor nuances. I can only begin to imagine the upcoming beer possibilities! The Breadfarm, a artisanal baker is using locally grown wheats similarly creating specialty baked goods that capture the flavor of the terroir–or specifically the Skagit sense of place. The support of multiple governments and the legal structure of the State’s Growth Management Act, have created a framework and standard to protect resource lands thus allowing creativity in food and beverage production that rivals European artisans. Entering the valley after an hours drive north from Seattle, all cares slip away and the eye gaze over the pastoral beauty. Spring is a favorite time for visitors to step into the Skagit ethos. Daffodil and tulip fields are sprinkled in the heart of farm country drawing the young and old to savor the splendor. The deep alluvial soils are turned awaiting their crop. The pulse of the country feeds our soul. Our bodies are awaiting the upcoming season to savor the delicacies of the earth. Note: Land use planners from around the country attending the national American Planning Association conference in Seattle can visit the Skagit Valley and learn what it takes to Cultivate a Thriving Agricultural Economy. Check out the American Planning Association’s mobile tours for Tuesday, April 21, 2015.